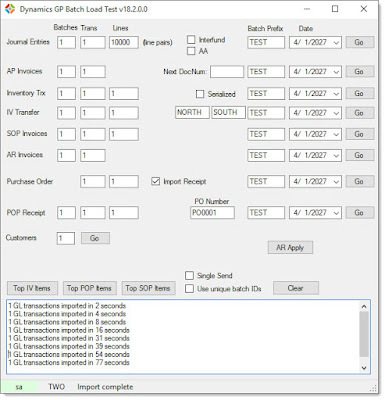 Steve Endow - The Blog: How long does it take to import a Dynamics GP GL Journal Entry with LOTS of lines? I received a question about the performance of eConnect when importing large GL Journal Entries, such as a JE with 1,000 lines. In some prior eConnect / GP load testing, I had only imported JEs with up to 500 lines, so I didn't know the answer. I just fired up my Batch Load Test import tool and tested some eConnect imports of GL JEs with lots of lines. Here's what I found. Your import times may vary depending on your environment, but this is some baseline data to consider. So it looks like eConnect can pretty easily import a standard JE with quite a few lines without any issues. CAN you import a JE with 20,000 lines? Yes. SHOULD you import a JE with 20,000 lines? I would not recommend it as a routine process. Break up the data into more manageable JE sizes. If nothing else, it will make reconciliations and research more manageable. Note that this is a standard GL JE without Analytical Accounting. In my experience, eConnect performance for a JE with AA is horrible. 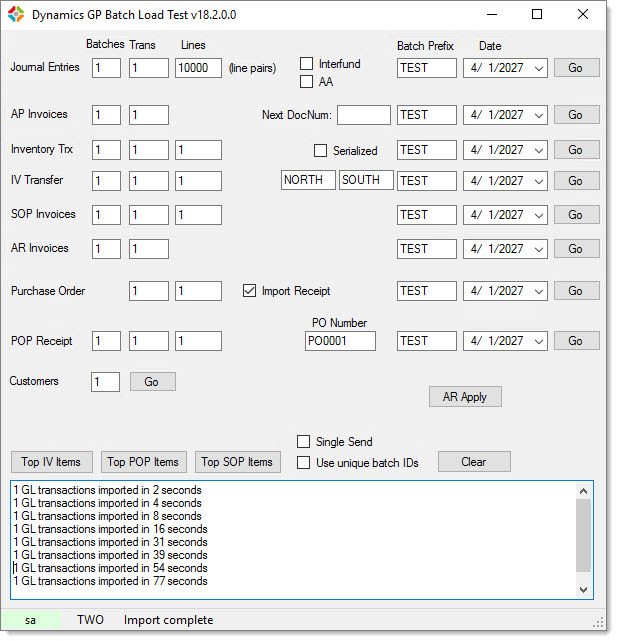 Definitely keep your JEs small and your batches small when importing with AA data.